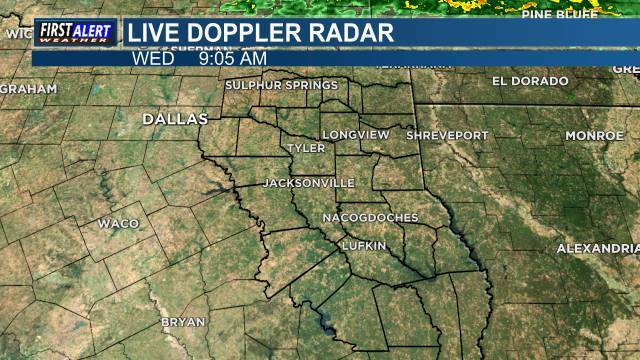 East Texas (KLTV) - Here is the Weather Where You Live... Cloudy skies and some areas of light rain continue over portions of our area tonight and we should continue to see scattered, mainly light rain, through the early morning hours on Friday. Rain chances then begin to increase during the day on Friday and into early Saturday morning as another cold front moves through East Texas during the early morning on Saturday. After the front moves in, the rain chances diminish pretty quickly and we may even see some sunshine on Saturday afternoon. Sunday and Monday look pretty good with chilly mornings and mild afternoons and sunshine. Tuesday through Wednesday, clouds slowly increase and so do the rain chances once again. We may be able to rest our umbrellas for a few days soon.